HELIX empowers Pharmaceutical organizations to manage critical drug discovery, development, research information as well as ad-hoc collaboration on artifacts and compliance management. 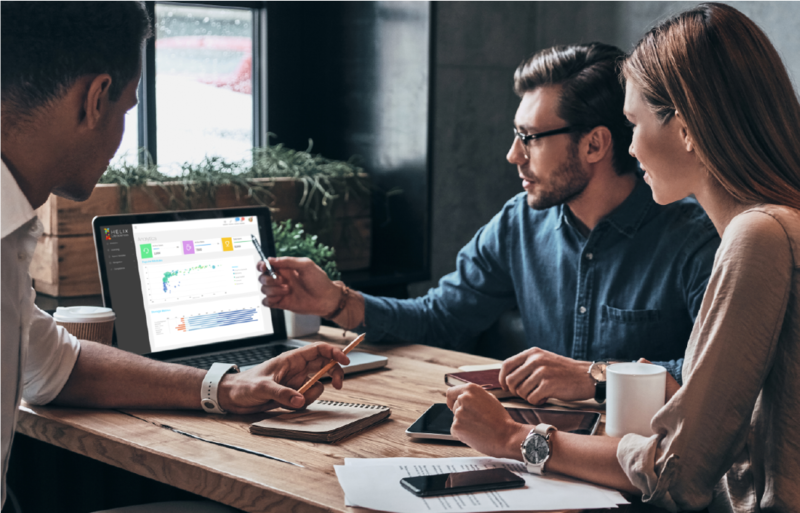 As a managed platform, HELIX will provide vital foundational collaboration components without requiring ground-up custom development, saving time and resources while getting your team producing results faster. 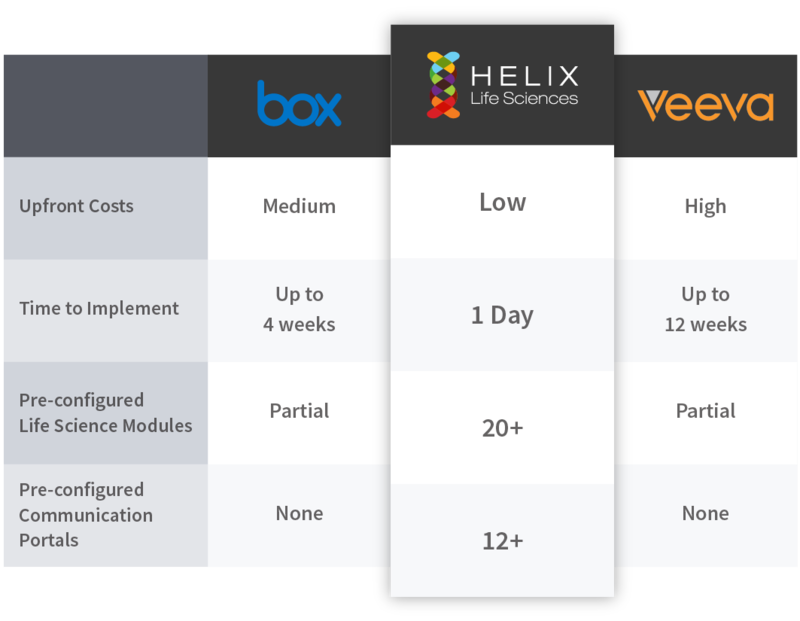 From a comparative view, HELIX offers an unprecedented ability to speed design, simplify implementation and accelerate deployment of a best-of-breed life science collaboration environment. HELIX was designed to deliver the advanced life sciences collaboration functions without the cost the development complexity. HELIX is about achieving your outcomes with a goal-based collaboration discipline. It provides an elegant, single dashboard for each product in your organization's pipeline. From quick access to product team members and sub-teams to the latest actions, documents, financial status, events and approvals of your project, HELIX provides a single platform to give you seamless visibility to all participants and aspects of your agenda. Built to work in the real world; you know, like yours. HELIX is built on the Office 365 framework, so users benefit from the ability to work within a familiar and intuitive environment. HELIX also supports robust and sophisticated customization through an extensive set of API’s, tools and standards, along with a well-establish technical ecosystem and community. 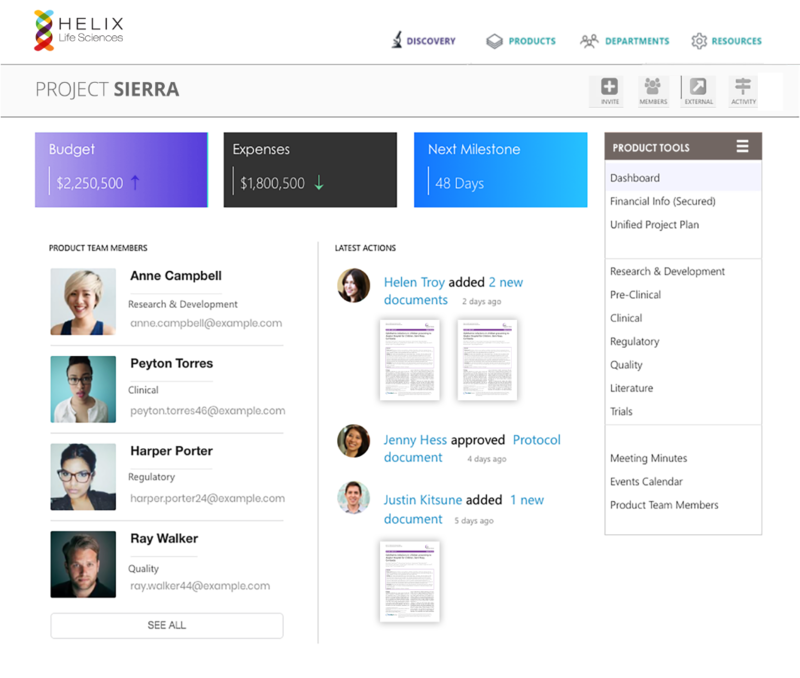 HELIX’s purpose-built for life sciences design approach delivers out-of-the-box functionality for your teams to immediately leverage collaboration benefits, and reduce development friction throughout the project’s lifecycle. An accelerated reality starts with the ability to quickly create your world, your way. HELIX makes it easy. You select from a number of purpose-built components and portals to instantly construct a robust collaboration environment. 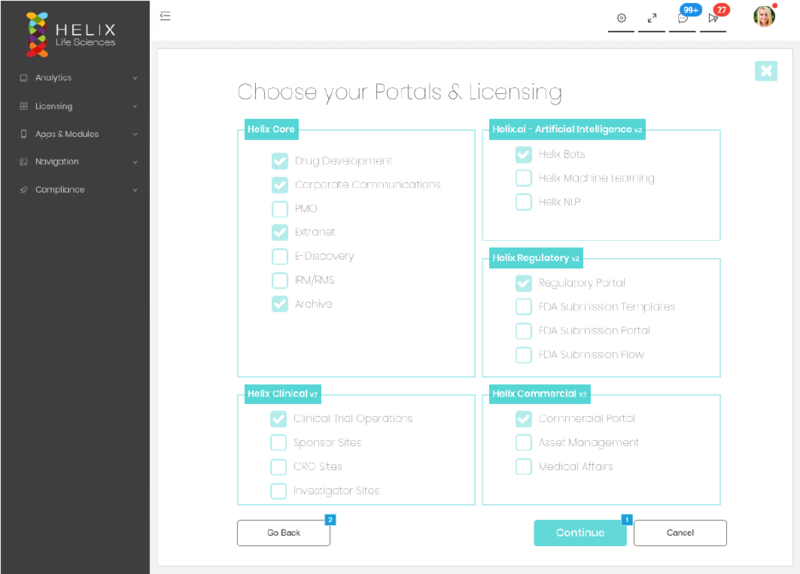 HELIX automatically sets up your portals with the features and attributes you identify, allowing you to organize your teams quickly, and get them collaborating from day one. 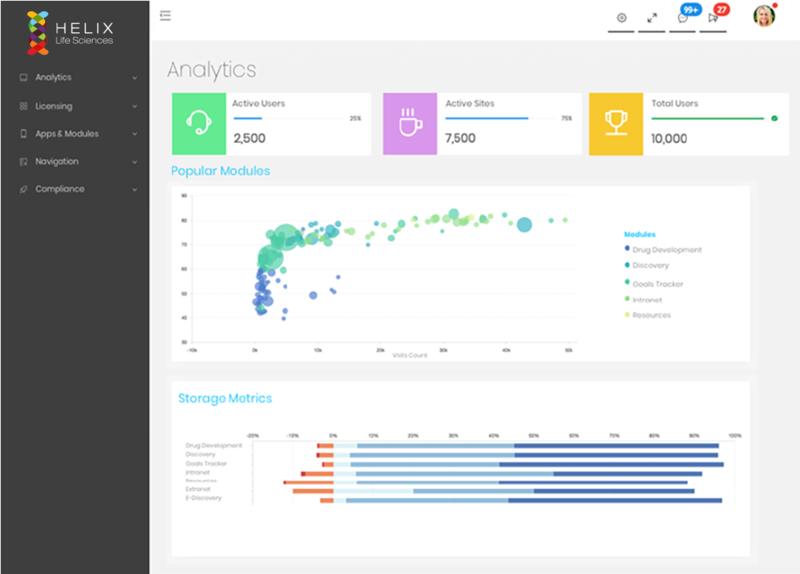 Create, view and manage multiple Discovery projects with seamless compliancy. HELIX offers the ability to quickly create initiative-specific development campaigns and then manage them throughout the discovery cycles. HELIX ensures not only and effective, goal-oriented process, but that all efforts and communications are accomplished under the strictest of compliance standards. Gain real-time insight to team and individual progress points and performance with HELIX’s comprehensive Goal Tracker. HELIX ensures your people and processes are always goal and outcome driven. HELIX Goal Tracking gives you insight and visibility to how your team is performing.  You’ll know at-a-glance if you’re tracking to your timelines or are at risk of slipping your schedule. 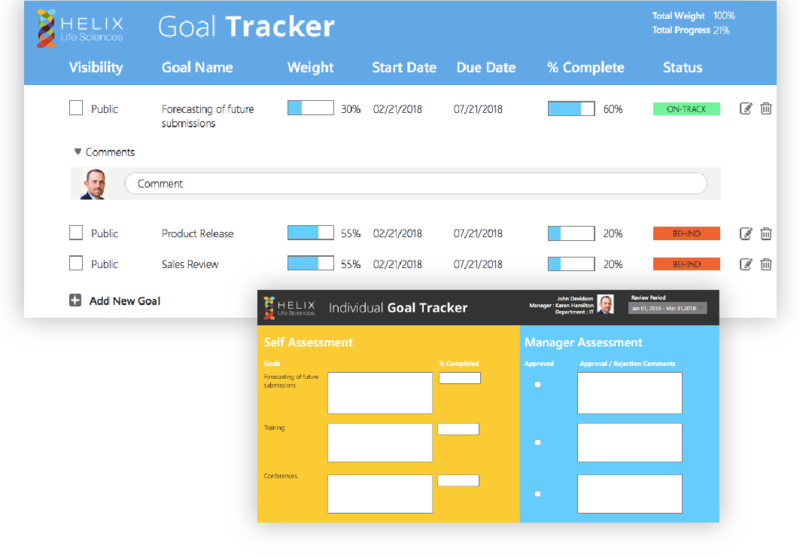 The Goal Tracker also enables performance management by supporting interactive team assessments and timely performance evaluations. 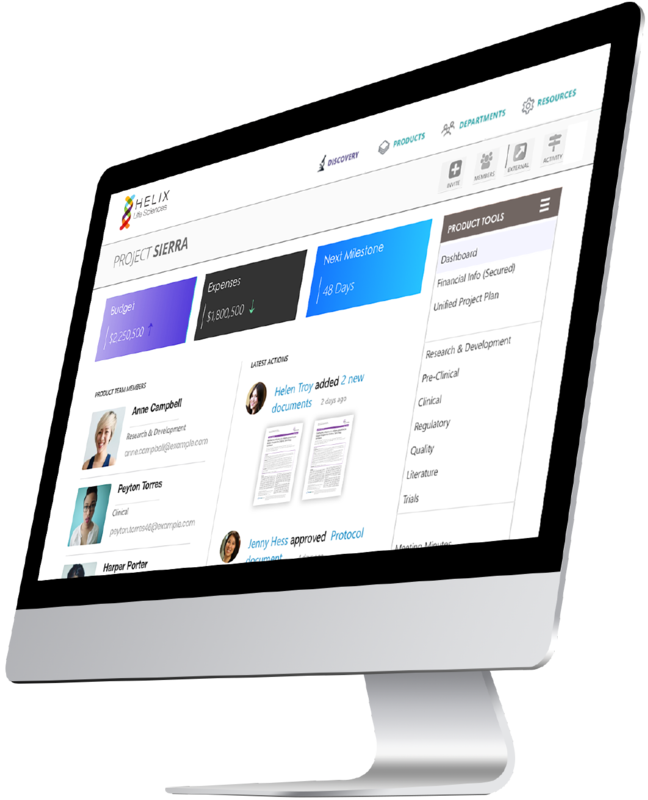 HELIX Assist™ will relieve you of redundant tasks to get your project and campaign up and running and support your end users throughout the development. HELIX features intelligent BOTs that will assist you in building and managing your campaigns. HELIX Assist will perform tasks for you such as constructing your discovery sites or creating additional virtual rooms for your team. 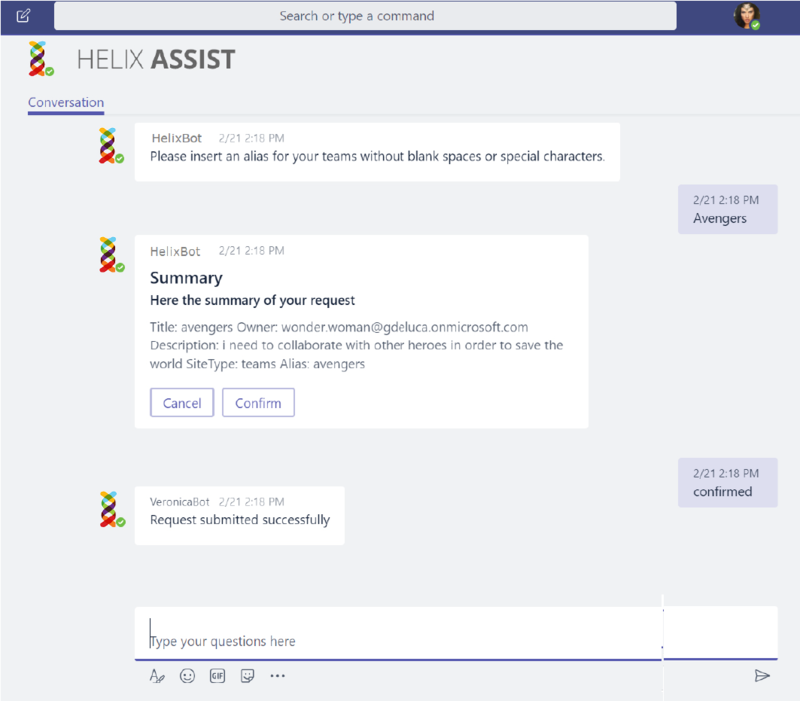 Your HELIX Assistant can also provide end-user support by answering various queries and requests – including intuitive access to SOPs. HELIX gives you 360° visibility of how your users are engaging and collaborating in a straightforward view. HELIX’s real-time analytics allow you to track utilization, gauge momentum, and proactively address team or individual issues. HELIX gives you the timely visibility to help you achieve your goals and hit all your milestones. From Corporate Communications to dedicated sales portals, HELIX allows you to quickly configure and launch comprehensive Sharepoint sites and portals. HELIX offers over 12 pre-configured modules that enable a quick configuration and implementation for any collaboration team. Also, HELIX components are fully modular and ready to be altered and refined to the specific needs, scenarios, and practices of your organization.